Versatile and strong, 398cc, DOHC, liquid-cooled, dry-sump engine has push-button starting. New white bodywork with red or blue accent graphics complement the motorcycle’s styling. A refined Mikuni 36mm carburetor, with new deceleration enricher circuit, is fed by a six-liter airbox to provide smooth throttle response when accelerating or engine braking. 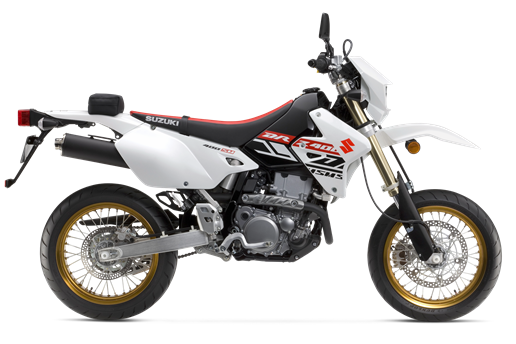 A variety of Genuine Suzuki Accessories for DR-Z400SM owners are available, including a low-profile seat, cargo rack, handguard set, and a large selection of Suzuki logo apparel.